As predicted, incumbent CD1 Councilmember Gil Cedillo is getting down and dirty as he fights to retain his seat in the face of a strong challenge from outsider Joe Bray-Ali. Today’s attack from the city’s most anti-bike councilmember comes in the form of repeated accusations that Bray-Ali is just a Republican in Democrat clothing. And that he only switched parties to run for office — fighting words in the strongly Democratic and independent district. Except he isn’t. And didn’t. Bray-Ali is the first to admit he was, briefly, registered as a Republican several years ago as he searched for his place in the political landscape, before landing in the Democratic party after equally brief stints as a Green and an independent. And never mind that Los Angeles local elections are supposed to be non-partisan, so whatever the hell party he belongs to shouldn’t matter in the slightest. More amusing is Cedillo’s claim that he’s running a grassroots campaign. Which is absurd coming from a career politician who gets the overwhelming majority of his donations from outside the district. And who has been in bed with mega donors like Chevron and Walmart for years, leading to questions whether their donations have influenced his votes. After Saturday’s bizarre Lyin’ Joe episode, and today’s overblown tweetstorm attacks, it’s starting to look like Gil has been studying at Trump U. And learning all the wrong lessons about how to conduct a campaign. A bike rider reports he was the victim of an assault on the LA River bike path at the Los Feliz overpass when he was punched by one of two men partially blocking the pathway. Fortunately, he was able to maintain control of his bike, and didn’t stick around to find out what they wanted. While incidents like this are relatively rare, it’s a reminder to always remain alert and aware of your surroundings when you ride, especially on bike paths or anywhere else out of direct public view. He did the smart thing by getting out of harms way as quickly as possible before stopping to call the police. He doesn’t give the date or time of the attack, but it makes me wonder if that’s why I saw a CHP cruiser turn onto the bike path as I passed by on Los Feliz Monday afternoon. 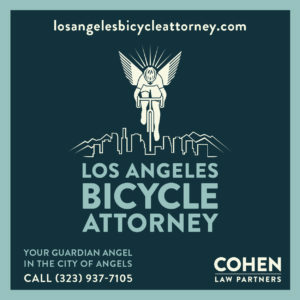 LA bicyclists have long called for regular police patrols on the bike paths in the city and county, to little effect; incidents like this sometimes result in an increase in patrols, which die down after awhile as other hotspots take precedence. Thanks to Chris Klibowitz for the heads-up. I may not have made myself clear the other day. While I am a strong believer in the need to fund Vision Zero projects in Los Angeles, and feel that it should take precedence over repaving streets and filling potholes, that doesn’t mean the latter isn’t important, as well. As yesterday’s tragic news reminded us, bad roads can be an expensive annoyance to people on four wheels. But they can be deadly to those of us on two. Vision Zero should not attempt to improve safety at the expense of our streets, but in conjunction with repaving efforts to ensure a safe riding, driving and walking environment for everyone. We have to somehow find room in the budget to pay for both. Because it doesn’t matter whether our streets are dangerous because of aggressive drivers, bad road design or crumbling street surfaces. The results are the same. And human lives are at stake. This is seriously one of the scariest close passes I’ve ever seen, as a driver for a British market buzzes within inches of a cyclist. But says it’s okay since he didn’t cross into the extremely narrow bike lane. Thanks to Jon for the link. I’ve never had a lot of heroes. Willie Mays when I was younger, Bobby Kennedy and Dr. King as I got older, though both were gone before I reached my teens. But there are a lot of people I’ve admired; a few I’ve tried to emulate. And one of the best and brightest of those was killed in crash early Wednesday morning. Steve Tilford was everything I wanted to be as a young rider. A passionate cyclist who was among the first wave of American riders to storm Europe and show that we could compete on equal terms with the best names in the sport, he made it all seem effortless, competing on the road and winning in mountain biking and cyclocross. According to various press reports, Tilford was driving on I-70 just west of the Colorado – Utah border when his van crashed into an overturned semi. He and his passenger were standing outside of the van, injured but okay, when a second semi plowed into the overturned truck, striking Tilford. He died a few hours later at a hospital in Grand Junction, Colorado. His passenger, Vincent Davis, was injured, and the driver of the second truck was killed as well. VeloNews sums up the reaction in the cycling world, while the BMC Racing Team’s Jim Ochowicz remembers him and offers his condolences to Tilford’s partner Trudi Rebsamen, a soigneur with the team. And Bicycling revives a 1998 profile of Tilford, saying he is why we ride. Now if you’ll excuse me, I think I have something in my eye. Another of those young riders from the 80s, American cycling great Andy Hampsten, is happy to share his love of cycling with young riders in Sonoma County. Scientists are trying to take the hell of riding cobbles out of the Hell of the North. The jury’s still out on the 2024 Olympics, but LA will be hosting the 2017 Police & Fire Games. 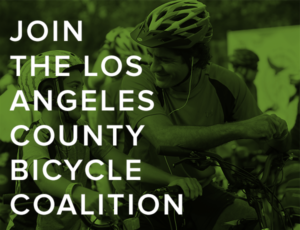 Sunday marks the return of the Brompton Urban Bike Challenge scavenger hunt in DTLA. 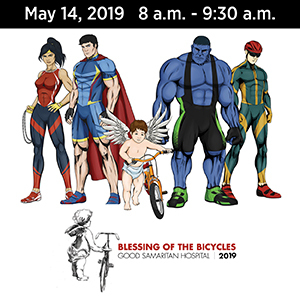 Bike SGV invites you to attend the opening of the Jeff Seymour Family Center on Monday. Topanga Canyon Blvd will be closed this weekend to repair storm damage and remove that big rock blocking the roadway. Speaking of big rocks, CiclaValley discovers Big Rock Canyon. The OC Breeze estimates that 15,000 people attended Saturday’s Garden Grove open streets event. San Clemente plans to provide a safer route to an elementary school by improving bike lanes and sidewalks on Avenida del Presidente. Indio is looking for public input on plans to install sidewalks and bike lanes. That’s easy. Yes. Please. Sad news from the San Joaquin Valley, as a man was killed riding his bike in Southeast Bakersfield. A Visalia man is scheduled to spend the next 34 years behind bars for shooting a bike rider from his moving car. Bay Area bike riders will finally be able to ride halfway across the Bay Bridge on weekdays. Then turn around and ride back, since it will be several years before the bikeway goes all the way across, if then. A UC Berkeley architecture professor wants you to bike along the big, not-so-beautiful wall already standing on the Mexico border with the US. Folsom is planning to complete the Johnny Cash Trail near the prison where he recorded the best selling live album of all time. Chico police bust an ebike thief who broke in from the shop next door to steal a $3,000 bike from a local dealer. A writer for City Lab says bike helmet laws do more harm than good, and the idea that they improve overall safety for cyclists isn’t backed up by the evidence. Someone vandalized over 200 of Portland’s 1,000 bikeshare bikes. Alaskan fat bike riders are risking their lives by riding through railroad tunnels to get to a near-wilderness area that’s closed for the winter. 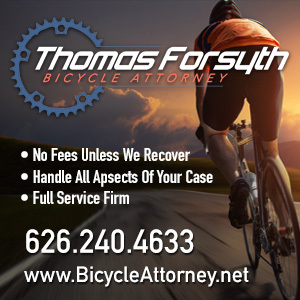 Prosecutors offer an undisclosed plea deal to a road raging Arizona driver who allegedly murdered a bike rider earlier this year; he faces up to 25 years if he’s convicted. Someone walked out with $8,000 worth of bike clothes from a trio of Dallas bike shops. A bike-riding Florida cop struggles to find answers in the wake of a recent tragedy, saying ultimately we must learn to care about others on the road, and encourage them to care about us. Caught on video: A Canadian thief demonstrates just how fast a poorly secured bike can be stolen. Four of London’s most dangerous intersections are scheduled to get bike and pedestrian friendly improvements. Which is exactly how Vision Zero is supposed to work. The Guardian asks if London’s cycling czar is tough enough to take on critics and bike-haters. On the other hand, at least they have one, unlike some cities I could name. Sometimes they do come home. Australian police recover an American man’s bicycle two years after it was stolen from a laundromat. Designer and cyclist Paul Smith is creating cycling jerseys for a bike race to help raise funds to rebuild a Japanese town devastated by the 2011 tsunami. Abandoned bikeshare bikes are crowding out humans in a Shenzhen, China park. No, popsicle bike is not a thing, but it should be. No, throwing your bike at an ex-friend who owes you money is not the correct way to use it. And which of these things are you doing wrong in your cycling class? That’s easy. Not riding a real bicycle outside, to start. A Republican by any other name….